This recipe couldn’t have come at a better time… As you may know, I am on a challenge to clean out the cupboards around here, and looking for uses for barley, condensed milk, among other things including moong dal, dried fruits. Perrrfect. I saw this at Veena’s and the original recipe which I followed is at Priya’s. Wash well, then pressure cook dal and barley with 3c water for 4 whistles. Release pressure and add condensed milk. Cook a 5-10 mins until thickened. In meantime roast cashews and raisins in ghee. Add to the pongal with cardamom powder. 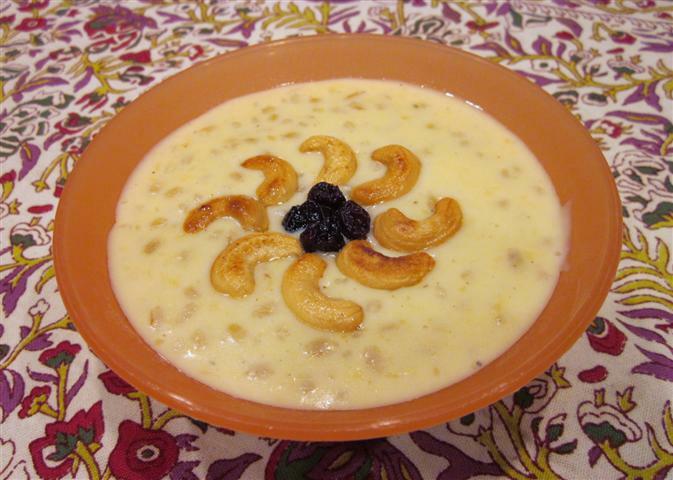 Click here to read more about Pongal from Lakshmi. Sending this to Kurinji’s Pongal Feast Event! Pongalo Pongal! Happy Pongal to all my Tamil friends!